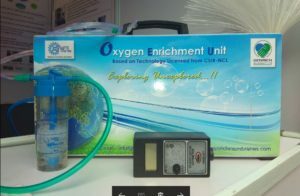 Product Description: The Oxygen Enrichment Unit provides 27-35% oxygen-enriched air as oxygen therapy for patients suffering from chronic lung diseases (COPD, asthma, interstitial lung disease) and for pre-term babies (blue babies) with Respiratory Distress Syndrome. The therapy is as essential as pills for the patients and is unavailable in semi-urban and villages/remote areas. With the enrichment unit, we aim to make oxygen therapy available to deprived sectors & for homecare application. Oxygen enriched air can also be used in aerobic fermenters, O2-spas/bars, car ACs & other comfort applications.